A medium weight throne with memory foam cushion. The seat is round and has a height collar for stability. Very comfortable and affordable. It features ultra grip wing nuts and wing bolts. 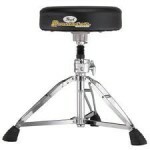 The same throne as the D-1000N but a shorter base. 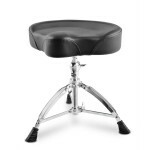 It has a well-padded swivel style seat. Very sturdy for those who prefer sitting low. A lightweight throne designed for easy packing. The seat is a round vinyl covered cushion. Double braced base. It features a slip proof height collar. Perfect for travel! Free shipping Continental US. This is a motorcycle style throne. It is the same throne as the D-2500BR without the back rest. 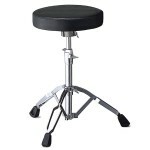 It is adaptable for adding a back rest. 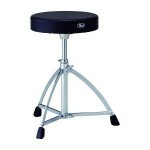 Heavy duty, double braced legs and thick padded seat. An excellent all around heavy throne. 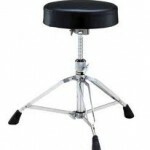 It has a well padded round seat which has a locking device to stop from spinning. Double braced legs are sturdy to support all weights. This is a very popular throne! 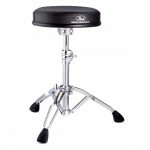 The D-1000SPN has a round seat and the basic features of the D-1000 but with a shock absorber post. If you move up and down on your throne a lot...this is for you. Heavy duty and very well padded! 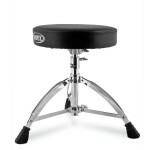 Heavy Weight, double braced legs, the DS 840 has a thick padded seat and has a screw height adjustment. The seat is round and the height adjusts from 18" to 25.6". This is a very sturdy, dependable, comfortable throne. 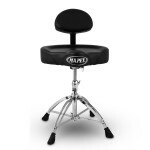 The Mapex T561A Round Top Throne is a very solid and affordable double braced throne. The size of the round top is a portable 13" x 2.5". The spindle adjustment at this price point is a real advantage. This is a firm seat with easy set up potential. 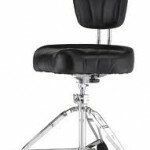 A heavy duty throne with a motorcycle style seat. 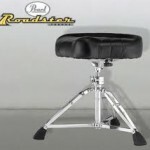 The D-2500BR has a quick release back rest. 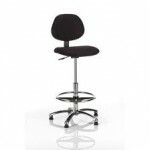 The back rest adjusts back and forward, up and down. Great for lumbar support. 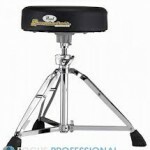 Also has a lock bracket for the seat and double braced legs provide for sturdy support.